I can’t believe I overlooked this photo–it’s one of my favorites. I did put it on another photo site, so that probably explains the confusion. I’m currently doing a 365-day project for regular photos and another for the iPhone, so I keep lists for those and the blog. I guess my system isn’t completely fail-proof! Anway, I had walked by this little birdhouse many times, but this particular morning the sun was hitting it just right and the leaves were so perfectly “arranged.” I love when that happens. 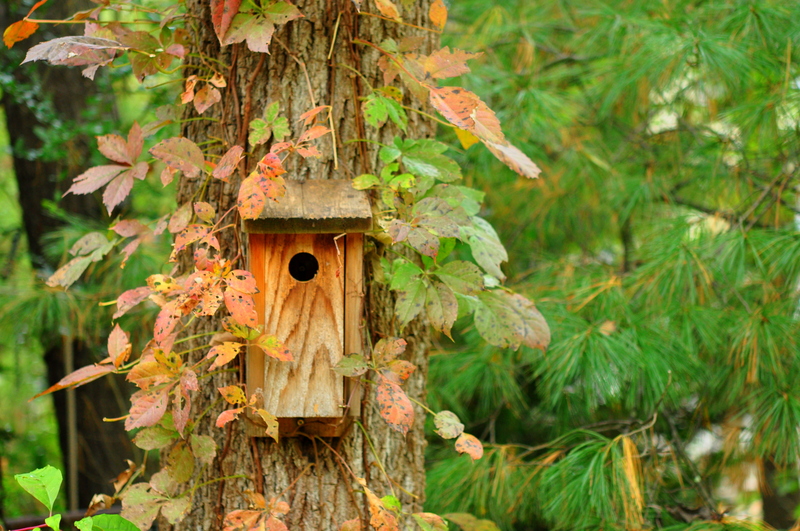 This entry was posted in photography and tagged autumn leaves, birdhouse, pines. Bookmark the permalink. Gorgeous! You know, I’ve never seen a bird use a house. This looks like a photo out of a fairytale book. It is like the enchanted forest, what a wonderful capture!